AP RGUKT IIIT Merit List, Selected Candidates list Wait List for vacancies, Provisional Selection List for CAP, NCC, PH quota seats in District wise for Nuzvid, RK Valley (Idupulapaya),Ongole, Srikakulam IIIT Six year integrated B.Tech Counseling details , Call Letters Download at admissions.rguktn.ac.in : The RGUKT IIIT Six year integrated B.Tech admissions Selected Candidates list 2017 announced by Rajiv Gandhi University of Knowledge Technologies from eligible 2017 SSC/10th Class Students in Andhra Pradesh State. The RGUKT IIIT Online application Submission will be closed on June 2017 for admission into 1st year of its 6 year integrated B.Tech programme at RGUKT Nuzvid and R.K. Valley IIIT’S. The RGUKT had totally 2000 Seats for admissions in to 1st year 6 year integrated B.Tech programme at RGUKT IIITs located at Basar, Nuzvid and R.K. Valley IIIT Campus in Andhra Pradesh. The RGUKT will Received totally 25000 online applications for the 2 IIIT Campus admissions every year. Announcement of Provisional Selection List for all campuses including Special Categories (PH/CAP/NCC/Sports) - Phase-II: 15.07.2017 Candidates can get the results from here. Counseling will be on 08-Jul-2017. 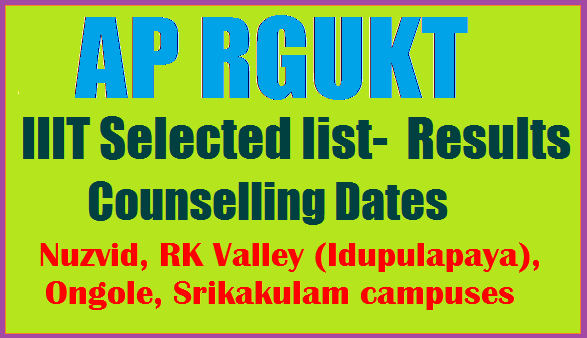 For more details AP RGUKT IIIT Results/ Selection List 2017, Counselling Dates visit rgukt.in , rguktn.ac.in , rguktrkv.ac.in Nuzvid, RK Valley(Idupulapaya) Ongole, Srikakulam campuses,Counseling Schedule 2017-18.